Officials predicted this would happen back in January. This post has been updated to reflect new information about the first cases of locally transmitted Zika virus in the United States, as of Aug. 1. Florida Gov. Rick Scott (R) announced that there are now 14 cases of locally transmitted Zika virus in South Florida on Monday and called on the U.S. Centers for Disease Control and Prevention to send a federal emergency response team to the area. In a press call with reporters Monday, the CDC noted that mosquito control measures were not working as well as health officials had expected and advised pregnant women to avoid traveling to the small but highly-trafficked area just north of downtown Miami, where there are active Zika transmissions. The area includes Midtown and the Wynwood Arts District, a neighborhood popular with locals and tourists alike for its many colorful street murals, restaurants and galleries. Pregnant women and their partners who live or work in the area should avoid mosquito bites at all costs, officials said. Other experts criticized the CDC’s narrow travel warning as too limited. “To assume that it’s just restricted to these few square blocks is presumptuous,” Dr. Peter Hotez, dean for the National School of Tropical Medicine at Baylor College of Medicine in Houston told Reuters. The health department is conducting door-to-door outreach in the area, and officials have urged residents to cooperate with requests for blood and urine samples so they can determine if there are more people who have been infected. Zika virus symptoms include red eyes, rash, joint pain and fever, but people who are infected may also be asymptomatic. Local blood banks are excluding donations from the affected area until proper screening mechanisms can be put in place. Of the 14 affected patients, two are women and 12 are men, the Associated Press reports. Officials said they have concluded “a high likelihood exists” that the cases were transmitted locally. Now that the Zika virus is present in the continental U.S., the U.S. Centers for Disease Control and Prevention advise everyone living in areas where the Aedes aegypti mosquito is present, and especially every pregnant woman, to protect themselves from mosquito bites by wearing long sleeves and pants and applying mosquito repellant. CDC director Dr. Tom Frieden also advised everyone be vigilant about eliminating standing water around their home, and to install or repair properly fitting window screens. Frieden also suggested that Americans close their windows and use air conditioning units if possible. The estimated range of the Aedes aegypti mosquito population in the U.S.
Frieden said that two of the people with local Zika infections were working in separate but proximate worksites within the area outlined in the map above. The entire area was sprayed to kill mosquitos as soon as local health officials made the connection between the patients and the neighborhood. The infections appear to have occurred in early July, Frieden said. One week later, the patients began experiencing symptoms, and a few more weeks after that they were diagnosed, prompting the investigation. The state of Florida first released news of a potential local Zika case on July 19. The CDC initially declined to issue a travel warning to the Wynwood neighborhood in Miami or to Florida in general because of how limited the cluster appeared to be, but that changed after Monday’s report of 10 additional local Zika cases. Frieden had pointed out that the Aedes aegypti flies less than 150 meters during its short lifespan, which is why health investigators were able to focus on such a small area. Frieden also reminded Americans that the U.S. has experienced several short-lived clusters of mosquito-borne diseases in recent history. Miami-Dade County leads the state in confirmed Zika cases, with 99. 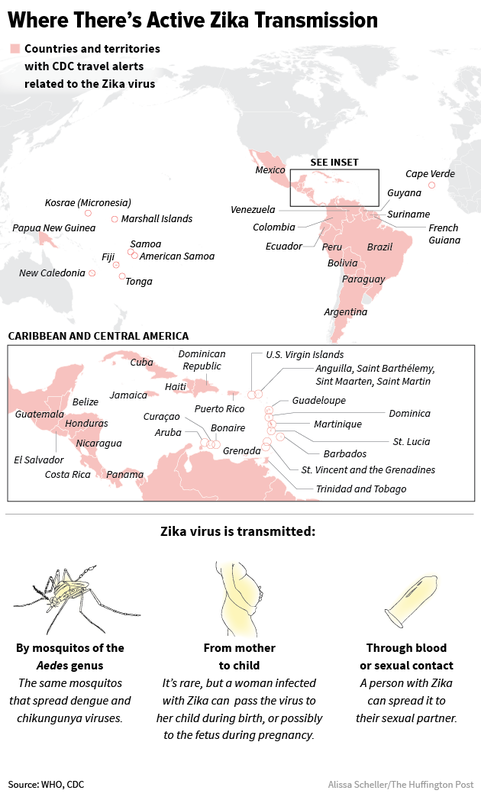 Aside from the suspected local transmissions, all other cases were related to travel to Zika-affected areas. The virus is currently endemic in 51 countries and territories around the world, and the CDC predicted in January that there may be a few small, local outbreaks in the U.S., specifically in the southern tips of Florida and Texas. Not only have both areas had past outbreaks of mosquito-borne diseases, like dengue and chikungunya, but they also receive thousands of people traveling from places where Zika is spreading, noted scientists from the University of Arizona, the National Center for Atmospheric Research and other institutions. The CDC said July 21 that beginning Aug. 1, it will award a total of $60 million to states, cities and territories to fund efforts to prevent Zika virus from spreading. These Zika prevention tools include mosquito control and monitoring, more laboratory capacity for testing, and beefing up disease surveillance and investigation. In a statement announcing the funding, Frieden said he hoped Congress will vote to provide additional funds. But as Vox pointed out, Congress just entered its summer holiday break without voting on $1.1 billion in funding for more Zika prevention measures. Experts predicted the consequences of that congressional inaction will include more babies in the U.S. born with microcephaly, a birth defect tied to Zika. Currently, 1,658 people have tested positive for Zika virus in the U.S. Of these, 433 are pregnant women. Fifteen cases were sexually transmitted, and five people went on to develop Guillain-Barre syndrome, a neurological condition associated with with the virus. Thirteen babies have been born in the U.S. with birth defects caused by Zika virus, including microcephaly, calcium deposits in the brain, excess fluid in the brain cavity or abnormal eye development. Officials have also counted six pregnancy losses with evidence of the Zika virus-caused birth defects. In addition to the 14 local cases, Florida has 331 cases of travel-related Zika virus in non-pregnant people, and another 55 pregnant women with the virus, as of Friday. The CDC has given Florida more Zika virus test kits if demand surges. Frieden said that the Florida health department will recommend that pregnant women in the area outlined by health officials consider getting a test for the virus, even though the odds of an infection are low.